This is a scalable context timeline. It contains events related to the event 9:37 a.m. September 11, 2001: Pentagon Security Cameras near the Crash Site Are Switched Off due to Renovation Work. You can narrow or broaden the context of this timeline by adjusting the zoom level. The lower the scale, the more relevant the items on average will be, while the higher the scale, the less relevant the items, on average, will be. Pentagon security cameras facing the crash scene allegedly have been put out of order by the attack. [Murphy, 2002, pp. 245] John Jester, the chief of the Defense Protective Service (DPS), runs from his office at the Pentagon down to the DPS Communications Center and orders, “Get a camera up there!” [Goldberg et al., 2007, pp. 152-153] As the Washington Times will later note, “The attack occurred close to the Pentagon’s heliport, an area that normally would be under 24-hour security surveillance, including video monitoring.” [Washington Times, 9/21/2001] However, some of the Communications Center’s eight wall-mounted monitor screens are blank, because the crash has destroyed the camera nearest the area of impact and cut connectivity to others. Furthermore, some of the security cameras at the Pentagon are currently inoperable because of construction work going on (see 9:37 a.m. September 11, 2001). Officer Jesse De Vaughn brings up an image from a camera at the Navy Annex, located a few hundred yards from the Pentagon, which is then focused onto the crash site. [Goldberg et al., 2007, pp. 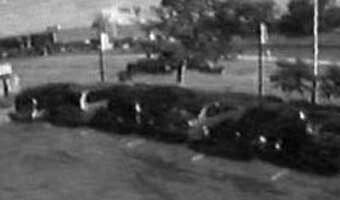 153 and 244] Two recently installed security cameras located north of the crash site in fact captured the moment the aircraft impacted the Pentagon (see 9:37 a.m. September 11, 2001). [Goldberg et al., 2007, pp. 161] The poor quality footage from these will be officially released in 2006 (see May 16, 2006). [Associated Press, 5/17/2006] Whether the cameras that were destroyed or disconnected when the Pentagon was hit captured the approaching aircraft or the moment of impact is unstated. A report in the Washington Times suggests, “Federal investigators may have video footage of the deadly terrorist attack on the Pentagon. A security camera atop a hotel close to the Pentagon may have captured dramatic footage of the hijacked Boeing 757 airliner as it slammed into the western wall of the Pentagon. Hotel employees sat watching the film in shock and horror several times before the FBI confiscated the video as part of its investigation. It may be the only available video of the attack. The Pentagon has told broadcast news reporters that its security cameras did not capture the crash. The attack occurred close to the Pentagon’s heliport, an area that normally would be under 24-hour security surveillance, including video monitoring.” [Washington Times, 9/21/2001] In a later report, an employee at a gas station across the street from the Pentagon that services only military personnel says the gas station’s security cameras should have recorded the moment of impact. However, he says, “I’ve never seen what the pictures looked like. The FBI was here within minutes and took the film.” [Richmond Times-Dispatch, 12/11/2001] In late 2006, the FBI will release the footage from the gas station’s cameras, along with footage from atop the Doubletree Hotel near the Pentagon. Whether the Doubletree is the hotel referred to in the Washington Times report is unknown. 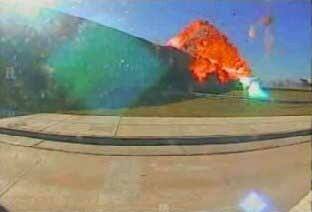 Neither of the videos will show the impact on the Pentagon, though the Doubletree video shows the subsequent explosion (see September 13, 2006-Early December 2006). Footage taken by the Pentagon’s security cameras and released earlier in 2006 will show that the Pentagon’s claim—that its own cameras did not capture the impact on 9/11—was untrue (see May 16, 2006).